The owner of this property located on the high landward bastions of Valletta wanted a place to hang his hat, where his main possession would be the views overlooking the harbour. Although the structure of the cellar of the house dates back to the 16th century, the house itself belongs to the redevelopment of the area named after the British Governor Hastings, and is largely 19th century both in style and building technology. The typology of the house is typical of this century with a mezzanine floor having an independent entrance and a piano nobile on the third floor. 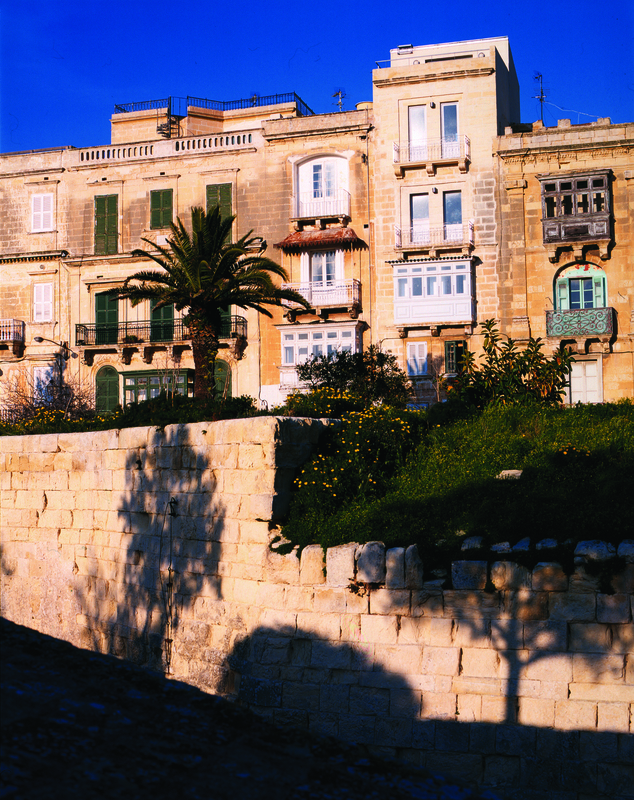 Its main entrance faces Hastings Gardens on St. Michael’s Bastion, overlooking Marsamxett Harbour and Msida creek with its marinas. The rich stratification of the site provided an ideal springboard for the rehabilitation of the building which stands proud of its surroundings and gazes out westwards towards the harbour and eastwards towards the town, exploiting the cool sea breezes in summer and allowing the low morning and evening sun to penetrate during the winter months. An extra half floor was added at the terrace level to provide the sitting room with a high space for the escape of hot rising air and to allow the terrace with its bbq area to participate visually with the public zone of the house. The more private bedroom area is, on the other hand, tucked away on the lowest floor of the premises, and is never reached by guests using the lift to enter the house. The materials used on this level are solid and resilient with a grey terrazzo used for the circulation spaces and ash flooring in the bedrooms, contributing to the quiet earthy atmosphere in the sleeping area. The latter is further enhanced by the renewal of the traditional Maltese wooden balconies which are found at this level and which are small spaces projecting outside the plane of the façade that serve as a filter of light and a sound buffer. The balcony overlooking the lane has been exploited to form an extension to the bathroom at the back.